The generosity of our supporters helps us to nurture our students which can lead to success in other aspects of their lives. I'd like to recognize those who have honored us with their financial support (see DhhEAF's Donor Hall of Fame). You've given us the opportunity to make a difference in the lives of many. Your support for the DhhEAF Program is greatly appreciated. Thank you! We uniquely have the skills, knowledge & experience to validate reaching additional DHH children and harbor hope that our Program is available to every DHH child in the country someday. We are motivated by our students’ enthusiasm as well as a dearth of programs designed to serve their special needs. We've taught Deaf students from all over the world including new students from Asia, Africa, Europe, and Central America. 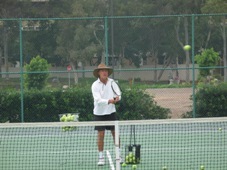 For the Deaf and Hard of Hearing, most importantly, tennis is a lifetime activity which does not require hearing. There is no distinct advantage for height or strength (or hearing). The Robert Wood Johnson Foundation’s Active Living Research Project proposes that physical activity can sharpen mental acuity. Roy has promoted the DhhEAF Program to parents, teachers, school Administrators and students whereby our sport can make better students: Enhances concentration, emphasizes the balance between physical & mental health, necessitates critical thinking / problem solving, and builds character. These theories are supported by a Formal 2013 Study: Compared to other sports, adolescent tennis players get better grades, aspire to attend college, stay OUT of the Principal's Office and volunteer for community service. Our program is working. Several students have shored up mediocre grades & behavior has improved at home & at school. They are more active & some have lost excess weight; they are playing less video games & interacting with new friends & family members in a healthy, fun way. Their regular teachers have noted their students' active participation, enthusiasm, and satisfaction. If we can define success by the joys of laughter, the excitement of learning, the look of determination to achieve, and the feelings of inclusion, then yes, the DhhEAF Program IS working! DhhEAF's non-profit status is the only way many of our students will ever touch a racket, AND get professional instruction. DhhEAF Co-founder and Executive Director, Roy Trafalski, is the only certified Tennis Pro (USPTA) in the U.S. dedicated to this population.